A working office environment can have a considerable impact on health and happiness, both of which can affect how well a business performs. Creating a workplace that boosts well-being and positive mental health can be beneficial for both employees and employers. 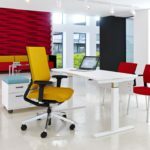 Let’s take a look at how everything from good desk layout and wise choice of furnishings to décor and lighting can help promote a successful workforce and overcome issues such as low morale, health issues and lack of privacy. Sedentary work is well known to impact negatively upon employee health. Aches and pains, poor circulation and musculoskeletal disorders can all result from lack of movement, and are responsible for hundreds of lost work days every year. Research has also shown that inactivity can lead to an increased risk of diabetes and cardiovascular disease. Productivity can suffer as a result, and sick leave becomes a massive problem. 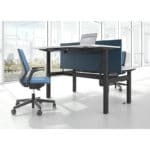 Introduce sit-stand working: sit-stand working is popular across Scandinavia where over 90 per cent of workers enjoy switching between standing and seated working. 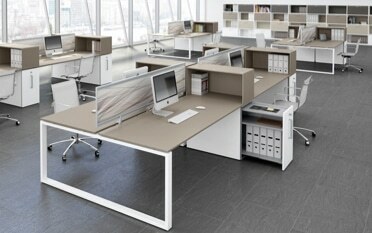 The benefits are numerous, and there are many sit-stand working desks to choose from. Promote activity: encourage staff to move around the office. Introduce breakout areas where people can get away from their desks and take some time out. Indoor or outdoor spaces away from the desk area will help prevent the issues associated with staying in the same position all day. Some companies provide activities such as table tennis which not only help with the promotion of movement, but also work to take the mind off work for a short time which can aid concentration. Think about colour: certain colours such as green are associated with happiness and creativity, whilst others such as red are connected with stress. 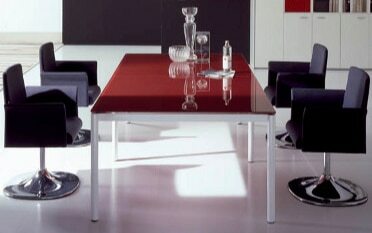 Be mindful of colour when decorating your office space. Be flexible: allow staff to decorate their own personal workspace with their own familiar items to help them feel more at home and motivated. Introduce natural light: a lack of natural light is well known to lower the mood. So do what you can to introduce as much natural light as possible. Large, open spaces with desks situated close to windows will help with this. If you cannot work with natural light, use lighting that replicates sunlight and fill your office space with plenty of greenery to give the impression of a natural environment. Remember that certain plants will also help to boost the quality of the air. 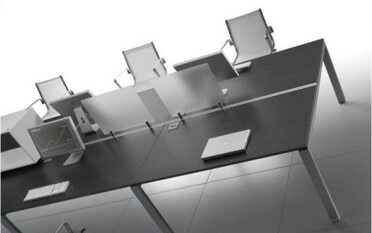 Height adjustable desks: height adjustable desks allow workers to switch between sit-stand working or to fix the desk at a height that works best for them. 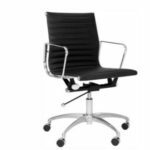 Ergonomic office chairs: ergonomic office chairs allow the seat height to be changed and also the back to be adjusted so the worker’s back and neck are supported. 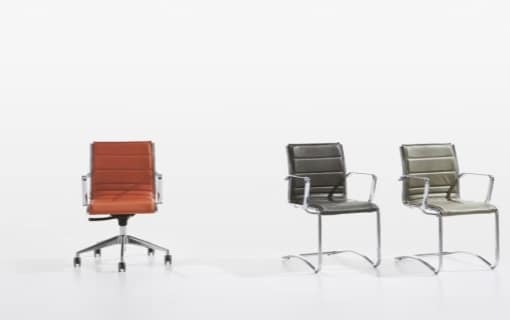 Chairs with removable armrests are a good idea as they allow the user to choose their preference. 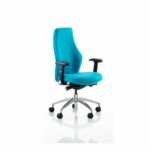 Ergonomic chairs also allow the user to recline when they wish to take a break from the upright position. 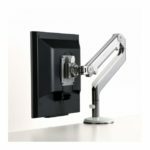 Desk accessories: monitor arms and footrests make the working position much more comfortable for many workers. Laptop stands are helpful to prevent poor posture and back and arm strain. 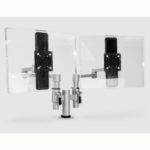 It is important that monitors are positioned at eye height and directly in front of the user and that everything necessary is within easy reach. Make sure employees don’t need to stretch, strain or bend to carry out everyday tasks. 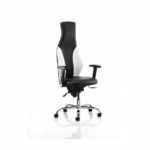 Ergonomically designed desks, chairs and accessories will assist with this and will help to prevent stress and in turn boost concentration levels. Open plan workspaces are great for encouraging collaboration and team motivation. However, shared workspaces can lead to distraction and increased noise levels, which can be a source of stress. Raised blood pressure and anxiety can also be symptoms associated with an open plan working environment, and colds and flu are much more easily spread. Sick days are proven to be higher in open plan workspaces. So, what to do? 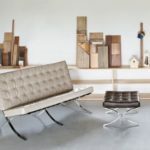 Strike a balance: There are pros and cons to all types of workspace, so where possible it could pay to strike a balance. If you operate an open plan space, introduce private areas for staff to retreat to when they feel the need. 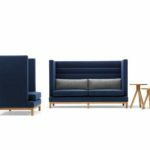 Add privacy seating: Privacy or booth seating is the ideal solution. The Max Office Booth seating range is one example. 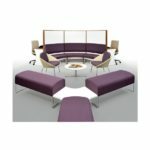 Ideal as an informal breakaway space or eating area, or a hub for meetings, the booth provides privacy within open spaces and features two sofas, a table and a linking screen. Office design has a notable impact on the physical and mental health of your workforce. A few simple steps can help to create a stimulating, comfortable environment that will lead to a positive, happy workforce and in turn boosted productivity, morale and loyalty. 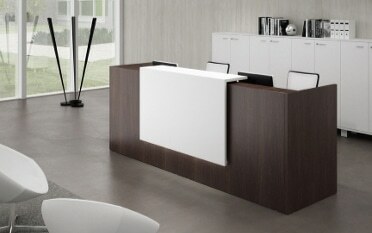 Tag Office is a nationwide supplier of premium quality office furniture. You are welcome to contact our helpful team at any time for personalised advice on creating the ultimate working environment for your valued staff. Why not get in touch today? We look forward to being of assistance! 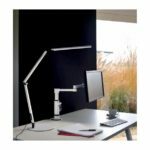 Posted in Breakout Zone, Height Adjustable Desks, Office design ideas, Office Desks, Office Seating, Sit-stand Desks and tagged Ergonomic Chairs, height adjustable desks, office design, sit-stand desks, sit-stand working on 12th October 2018 .